← Happy blog birthday to me! I love a cheese straw. These are dead easy – you could make them with just pastry, cheese and an egg – but with a few simple additions (obviously leave out the ham if you want them vegetarian) they’re extra tasty. Not the most exact recipe – measurements are all going to depend how big your pastry is rolled out and how finely you grate your cheese. My top tip is to grate the cheese finely as you use less and actually get more flavour. Pre heat the oven to 220C and get a couple of baking sheets ready. Flour a clean, dry surface and spread out the chilled pastry. Roll it out a little thinner – you should have a fairly large rectangle. With the longest side of the rectangle closest to you, smear the mustard in a thin layer over half the sheet of pastry, like a page of a book. Sprinkle about two thirds of the cheese over the mustard, followed by most of the rosemary – keep about a teaspoon back. Lay the Parma ham over the cheese, covering as much of the area as possible, then sprinkle the rest of the cheese on top of the ham. Fold the uncovered half of the pastry over the top, like you’re closing a book. Press the outer edges together to seal it a bit, then use the rolling pin to flatten it all out a bit more and squidge it all together. You should still have a rectangle shape, so with the longest side towards you again, use a very sharp knife to cut from top to bottom in strips about an inch wide. Give each strip a couple of twists and place on your baking sheets, leaving some room between each one as they’ll puff up when cooked. Beat up the egg and brush each twist, then sprinkle with the remaining chopped rosemary (and any cheese crumbs left over). Bake for 10-15 minutes – they’re done when golden and delicious smelling (check the underside also looks cooked). These are at their best still warm. 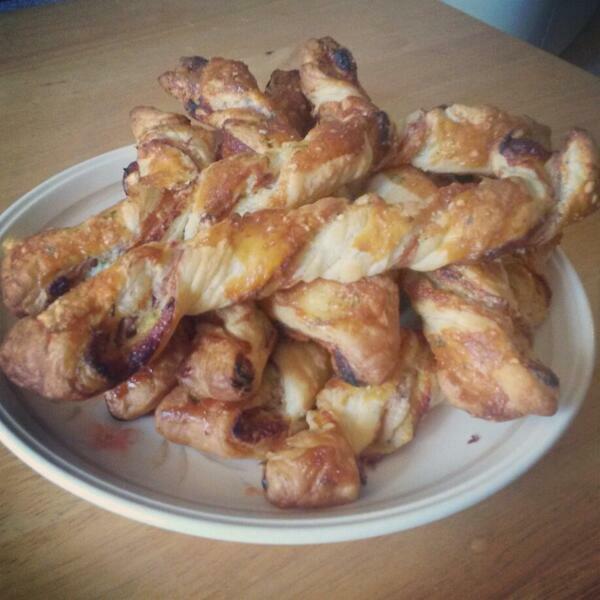 Posted in Easy Bakes, Pastry, Savoury Bakes and tagged bacon, cheese, cheese and bacon, cheese straws, easy, ham, mustard, Parma ham, pastry, puff pastry, rosemary, savoury. Bookmark the permalink. They look great, do love a cheese straw! Me too! Impossible to have just one though!